Is it snowing in Sapporo Teine ?Thank you! Located just to the Northwest of Sapporo, Sapporo Teine offers incredible skiing and phenomenal scenery right on the doorstep of Hokkaido's biggest city. The Highland area is connected to the Teine Olympia zone just below it by ski lifts, runs and the main access road. All tickets are valid for both and the two areas are operated as one resort. The Highland area is fairly steep with some narrow, switchbacking cat tracks connecting the main groomed runs meaning most beginners and intermediates looking for good open groomers will be happier lower down in the Olympia area. 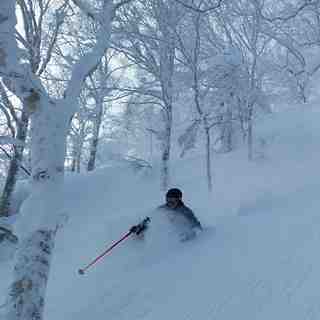 For advanced skiers and riders looking for steep, varied terrain with chutes, drops, glades etc Sapporo Teine should be at the top of your list. Access to the highest lifted point is via the new Summit Express quad chair (opened Dec 2008) allowing quick top to bottom laps. 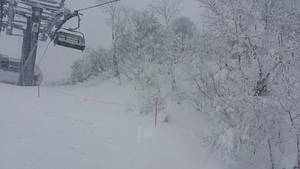 Also from the top of the Summit express, Sapporo Teine resort permits a short 10 minute walk to the old ropeway station (decommissioned in 2008) from where you can access a series of steep powder bowls. All of these bowls ski back to lifts but make sure you know where you are going (or travel with someone who does) as there are no signs and the trail back is just a ski track. If you do miss the track home, you will be in for an extremely long walk. It is important to remember that in out of bounds backcountry terrain, there is no ski patrol and you are riding at your own risk. As such appropriate caution should be taken if you choose to enter this area. This is definitely a nice gem. First, it's easy to reach, just 30 mins from Sapporo center. We took an online pack bus + lift from Kamori Kanko. Hit the slopes more or less at the opening and left just after sunset. The place is well organized, with everything (rents, lunch, etc...) in the same place. And yes, it's a small mountain. Just one high speed hooded lift to access everything. 500m vertical. But the snow is really deep and light. Plus, it's steeper than most Hokkaido. Kitabake (the narrow black run with trees in the middle) is a must do; magical. Freeride seems plentiful (not tried).